When the Grammy Award-winning Soweto Gospel Choir performs classic spirituals and gospel favorites Friday, Dec. 18 at Weill Hall in the Green Music Center, the 20 singers hope to generate some heat. Touring in Canada last week, Mulalo Mulovehzi, general director of the Soweto Gospel Choir, said he was missing his hometown of Johannesburg. “It’s cold here, nothing like home, ” he said by phone from Toronto. 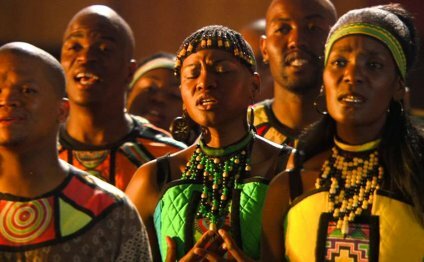 Such familiar songs as “Amen, ” “Amazing Grace, ” “Kumbaya” and “The Lion Sleeps Tonight” are all part of the Soweto Gospel Choir repertoire, but the vocal arrangements incorporate authentic African rhythms and harmonies. Audience response does vary around the world, he said. Some 60 to 70 percent of the original members of the choir, founded in 2002, are still with the group, and auditions replenish the ranks as needed. Applicants need to be not only great singers, but also able to really get into the spirit of the music, Mulovehzi said. “We look for that special talent, ” he said. The group, which spends six to nine months on the road all over the world every year, flies home to Africa on Christmas Eve this time. For an ensemble that has traveled and performed so often and for so long, the stress could make it hard for the singers to remain as mellow offstage as they are onstage, but their director said the performers are able to stay peaceful. “We do have challenges, but because of the experience we have, and the good company, it’s not so stressful, because we do get days off as well and stay in nice hotels, ” Mulovehzi said. Where: Weill Hall at the Green Music Center, Sonoma State University, 1801 E. Cotati Ave., Rohnert Park.